I finally finished! And I learned how to use my new Silhouette. Hallelujah! I made about 20 of these for my dad for his birthday/ house warming present. 1. 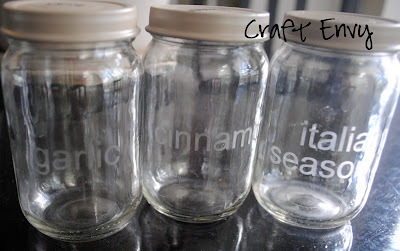 Clean your jars of all the stickiness from the labels. I found that if you spray them with WD-40 and then scrub them with an abrasive sponge, that works great. 2. Cut our your fonts in vinyl. I used font size 48. 3. 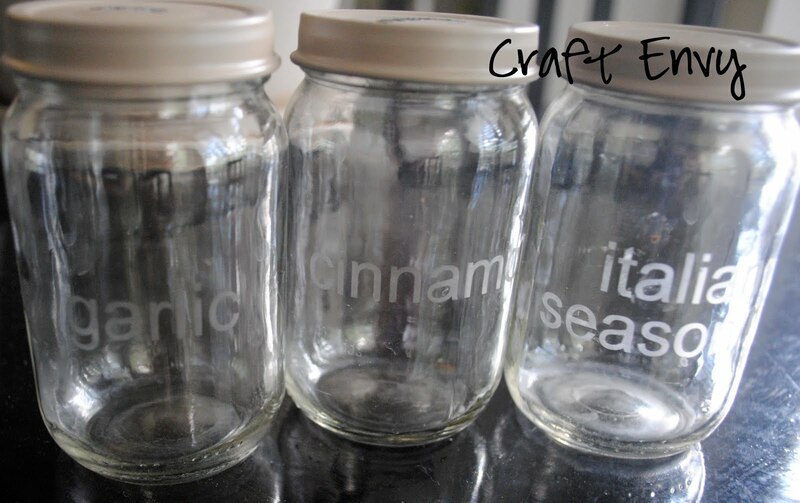 Carefully cut out your labels and put them on the jars so the letters are taken out. 4. Apply Armour Etch to only the area inside your letters. Let set five minutes. Rinse. Dry. Then remove you labels and clean with window cleaner. 5. Paint several coats of spray paint on your lids. 6. I added another label to the top of the lids just for fun. Great idea! I'm going to have to try that etching thing one of these days. Following you now from Toot Your Horn Tuesday Blog Hop. Please follow my blog of inspirational messages. Now on Twitter! I love it! I may have to purchase a silhouette. I grow my own herbs and always need neat jars to house them in! Very classy spice jars. Standard jars are too small - these area great size. Love it! I too have a silhouette, am really just beginning with it, but so far soooooo good! Love your spice containers. Good Job! oooo Like that idea! Looks good! That's a neat way to reuse all those jars! I may have to start saving them from now on. Thanks for the awesome idea. Such a handy idea! Thank you for sharing it with all of us! What a super cute idea and so functional! Hey girls, I just did almost the same thing but with diferent figures and designs, and my post will be in the begining of october, what the odds to have almost the same idea, well you will see what I did in a couple of weeks. This is just so creative! Way to go, girly! I'm happy to be your newest follower of your delightful blog and I'd love to have you as a friend at Frou Frou Decor! I would also like to invite you to link your sweet creations up at my weekly FABULOUS FRIDAY FINDS party! Hope to see you there! I LoVe this idea but I think the baby food company woke up to this and the baby food jars we buy here don't screw back on properly. So you never get that tight seal like you used to. Ive had to throw dozens of those jars in the recycle bin as we can't re use them.Maybe they didn't want mothers reusing them to put their own baby food in there. Either way i think it's a big shame. It's a great idea if you can hold of decent baby food jars or maybe use other type of jars. Very cute! I would love to adapt this for my daughter's beads & hair knick knacks. How do the spray painted lids hold up over time...does the paint chip off? Nice one, I thoroughly enjoyed reading your blog for baby bibs . I really appreciate your wonderful knowledge and the time you put into educating the rest of us.